It was definitely a very good year for StumbleUpon- The company continued its great growing momentum from 2010 and back in October celebrated 20 million members. 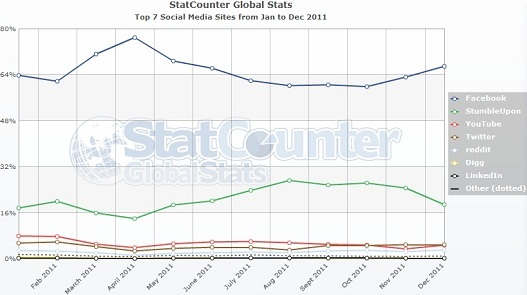 In the spirit of the holidays and as 2012 is almost here, the social networking service has just released its 2011 review and i though it was also a good time to examine how the site is performing. February- Super Bowl game, 41 stumbles per second through mobile devices. March- Tsunami In Japan, 41 percent increase in Japan-related stumbles. April- Royal Wedding, 96 percent increase in UK-related stumbles. May- Death Of Osama Bin Laden, 932 percent increase in terrorism-related stumbles. 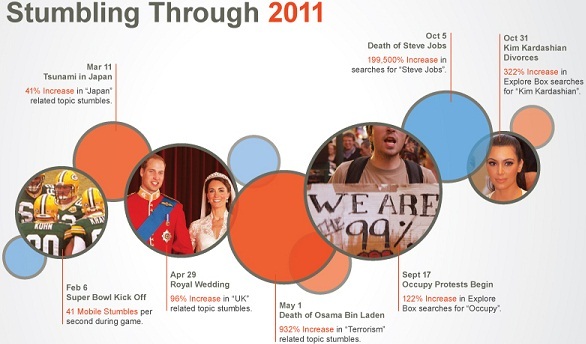 September- Occupy Protests, 122 percent increase for occupy-related searches in the Explore Box. October- Steve Jobs Dies, 199,500 percent (!) increase in Steve Jobs-related searches. October- Kim Kardashian Divorces, 322 percent increase in Kim Kardashian-related searches. According to StatCounter, in December StumbleUpon was the second most popular social network (based on referring traffic stats) with nearly 19% social media share. This is a rise from the 17.7% share it had in January, however, it is down from the 27% peak it had in August. 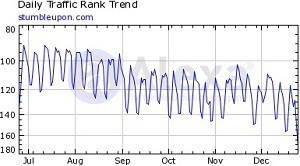 In order to examine if indeed StumbleUpon suffered from a decline in traffic in the last few months, i double checked it with data from Alexa which also confirms it- While StumbleUpon’s traffic peaked in July-August, since then it is gradually declining.